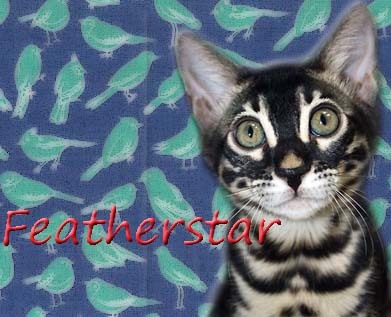 Eaglesnow licked Featherstar's shoulder, then sat back and listened to the clan call out his new name. "Eaglesnow, Eaglesnow, Eaglesnow!" cheered Runningelk for the clan's newest warrior. Swiftleaf padded into the TigerClan camp, carrying burdock root in her jaws. She made her way into her den, placing the root into the storage. Morningfoot padded into the TigerClan camp, carrying a rabbit in her jaws. She made her way into the elder's den, dropping the rabbit at the elder's paws with a dip of her head. Brightleaf padded past her clanmates and into the nursery, squeezing inside carefully. Once inside, she dipped her head to the other queens and settled down into an empty nest. Echopelt pricked up her ears and padded over to hear what Featherstar had to say. "We gather today to welcome a kit into her life as an apprentice." continued Featherstar once the clan had gathered. "Sootkit, you will be known as Sootpaw. Scarletcloud, you will be mentor to Sootpaw." Sootpaw stuck her nose into the air and padded over to Scarletcloud. "Go get to know your new denmates." meowed Scarletcloud as she touched noses with Sootpaw. "Sootpaw, Sootpaw, Sootpaw!" cheered Berrykit for his former denmate. Swiftleaf padded out of her den, carrying the body of Morningfoot in her jaws. She made her way into the center of the clan camp, placing the deputy down so the clan could grieve. Emberclaw padded out of the nursery and pressed her nose into her mother's fur. Featherstar pressed his nose into Morningfoot's fur, then tossed his head back in a yowl. "Cats of TigerClan. Listen, And I will appoint the new deputy. I say these words before StarClan so our ancestors may hear my approve and choice...Echopelt will be the deputy of TigerClan!" "Th-thank you, Featherstar." meowed Echopelt, her ears pricked in surprise. "Echopelt, Echopelt, Echopelt!" cheered Scarletcloud for the clan's new deputy. Swiftleaf padded into the TigerClan camp, carrying cobwebs in her jaws. She made her way into her den, placing the cobwebs into the storage. Scarletcloud pricked up her ears and padded over to hear what Featherstar had to say. "We gather today to welcome two kits into their lives as apprentices." continued Featherstar once the clan had gathered. "Ivykit, you will be known as Ivypaw. Eaglesnow, you will be mentor to Ivypaw. Foxkit, you will be known as Foxpaw. Ashwing, you will be mentor to Foxpaw." Foxpaw puffed out his chest and padded over to Ashwing. Ivypaw's tail bristled as he slowly padded over to Eaglesnow. "Let's go check out the territory." meowed Ashwing as he touched noses with Foxpaw. "Go get to know your new denmates." meowed Eaglesnow as he touched noses with Ivypaw. "Ivypaw, Foxpaw! Ivypaw, Foxpaw!" cheered Hickorytail for the clan's newest apprentices.